You are viewing the archived Car Servicing chains rating page. Follow the link to view the current Car Servicing Chains ratings. Compare car servicing chains in New Zealand at Canstar Blue. Oil Changers, AA Auto Service & Repair, Pit Stop and VTNZ were compared on value for money, time taken, cost of any parts required, warranty of repairs, effectiveness of repairs, customer service, advice received and overall satisfaction. Canstar Blue research finalised August 2017 and published November 2017. 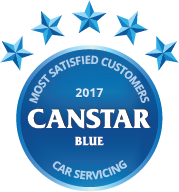 Making it five in a row, Kiwi car servicing company, Oil Changers has once again claimed the Canstar Blue Customer Satisfaction Award for 2017. Proving themselves to be unbeatable, Oil Changers were the only provider to earn a maximum five star rating – and they did it in every category! In New Zealand we love our cars but to make sure a vehicle is running smoothly and efficiently it is important to service it regularly. How often depends on the make, age and mileage of your car (you should be able to find the correct service frequency for your car in the manufacturers handbook) but a good rule of thumb is once a year or every 10,000km. Like 23% of the people Canstar Blue surveyed, it may be tempting to skip a car service or get it done less frequently, after all it will probably save a few hundred bucks. But be careful, this short-term gain could lead to long-term pain on you and your wallet as a lack of general maintenance can result in some pretty major – and expensive – problems later on. Advice received – We’re not a nation of car mechanics so a little bit of advice on how to maintain our vehicle can go a long way! Value for money – Some of us want cheap and cheerful, some prefer to pay more to get more but whatever your preference, it’s important we think we’re getting our monies worth. Customer service – Not really surprising that this was one of our main drivers of our satisfaction. Clear communications, keeping to appointment times and letting us know when we might have to pay a bit extra can really make a difference. Warranty of repairs – Those repairs we may not have been expecting cost a good few bucks so we want peace of mind that if it does go wrong again, it’s not going to cost more money. Cost of any parts required – Obviously the less surprises here the better. As mentioned, Oil Changers has proven itself a champion of car servicing since 2013, again rating five stars in overall satisfaction. The company’s website lists a wide range of services it offers with the price of its full services starting at just $79.95 – considerably lower than the advertised prices for similar services by its competitors. On top of its other services, Oil Changers also offers free checks & top ups to eligible customers. AA Auto Centre offers up to four levels of car servicing ranging from bronze to platinum – platinum being the most comprehensive package. Prices begin at $179 ($159 for members) for its non-European petrol car bronze servicing deal. Pit Stop’s website advertises five services: Express, extensive, elite, eurocar and Diesel, vans & 4 x 4. The basic express, 15-point check package starts at $139. With 82 branches nationwide, VTNZ is the largest provider in New Zealand. They offer a basic service as well as a range of maintenance and assessment packages. Canstar Blue commissioned I-view to survey 2,500 New Zealand consumers across a range of categories to measure and track customer satisfaction. The outcomes reported are the results from customers who have had their car serviced in the last two years by a car servicing chain – in this case, 803 New Zealanders.